From now on, passing the Alps at the Gotthard Pass will only take 20 minutes instead of 75. The Swiss goverment expects costs for railway companies to decrease by 30%. This will not only lead to a higher attractivity of the region for tourism, but also have a strong impact on the economy, since trade between the southern and northern countries of the Alps will be easier, faster, cheaper and more reliable, because trasportation becomes more independent from the weather. While in the past all trains had to overcome a total difference in altitude of 680m, it will now only be 90m. This allows a 1600 tonns heavy train to set 2 railcars aside and pass the tunnel with only 1 railcar instead of 3. This will also lead to decreasing shunting times. Expertts expect the currently trasnported amount of 15 million tonns of goods to skyrocket within the next years. To achiev this goal, railway companies urge regulatory authorothies to extend the allowed total lenght of a single train from 740m to 1500m. By doing so they argue, the loads of 240.000 trucks passing the Alps could be relocated to trains by 2030. Tests with these long trains are currently conducted in the Gotthard Base tunnel in order to gain experience. However, to achieve the biggest benefit possible for all, additional construction and expansions of the the existing infrastructure in Germany and Italy have to be realized. Due to delays in these countries, the final axis will not be fully completed before 2035. In a logistic network, a number of actors will influence business costs and corresponding environmental impact. Suppliers, manufactures, consumers, logistic operators, as well as third parties operating in testing, refurbishing, recycling and energy production for the end-of-life products are the main players. These players perform majority of the activities impacting business and the environment. The decisions regarding these activities will, therefore, determine the network costs and environmental impact. These decisions are strategic (e.g. location of factories), tactical (e.g. 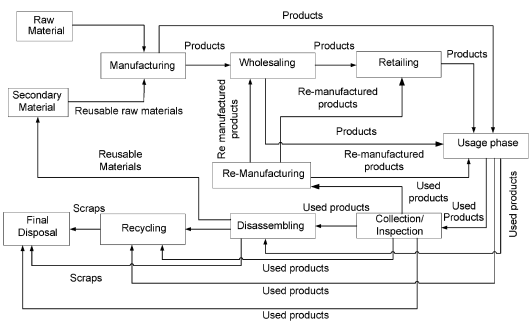 the destination of products end-of-life) as well as operational (e.g. the choice of suppliers, third parties, etc.). So, in order to diminish the environmental impact caused for the current logistics networks, there are specialists that have developed a procedure called multi-objective programming (MOP) with the aim to design sustainable networks. Provide an upper bound for a system from a game theoretical perspective. Modeling environmental legislation is an example of a bi-level game: the government creates legislation to mitigate environmental impact, without damaging the economy, while companies adapt to such legislation—working to minimize the associated additional costs. Determine the cost of decreasing environmental impact for the sector under study. Determine the efficiency of the sector relative to the environment and costs. The efficiency will tell us how much the system can be improved with initiatives integrating and directing the players within the logistic network. This re-design of the logistic network can happen directly, by a self-reorganization of the players as well as indirectly via a leader, from a game theoretical perspective. Determine ‘‘optimal’’ configurations for the sector under study. This study is based on numerous formulations that calculates the efficiency of the network, how the efficiency changes depending on the legislation, and so on. In this post one of my last contributions to this blog let me introduce some key factors related with two of the most important companies in the Valencian Region and in Spain. On the one hand, I would present Consum supermarket. This company was born in my town, Alaquàs , in 1975. On the other hand, Mercadona was founded in 1977 within the group Cárnicas Roig. The first Mercadona supermarket was emplaced in Tavernes Blanques and opened their doors in 1977. See Images 1 and 2. Some months ago I had a great experience in the local market, the butcher woman told me about the critical situation of the economy and the quality of the products introduced in the local market. She introduced to me an unknown fact, the second Mercadona supermarket was emplaced in Alaquàs changing the consumption habits of the customers forever. The rivalry between these two models is very clear; Consum is a cooperative model which includes workers and consumers partners. Mercadona is directed by Juan Roig and is configured by 100% Spanish and familiar capital. Mercadona include in their offer “intreproveedor” products like Hacendado, Deliplus, Bosque Verde. Consum offers a wide variety of brands and their own Consum brand. The price depends on the product but Consum is slightly more expensive. Both are emplaced in well positioned areas within cities. See Images 3 and 4. Nowadays Consum has more than 660 supermarkets between Consum, Consum Basic and franchises Charter. The collective consumer member now exceeds 2,600,000 people. Mercadona has presence in 50 provinces of 17 regions with a total of 1,587 convenience stores (05/06/2016). This supermarket satisfy the needs of 5 million household. Despite the different strategies both supermarkets have a strong dominance in the Levante area. Image 5. Mercadona Logistics. Reproduced from <http://bit.ly/1tatbnd&gt;. [Accessed: 06/05/2016]. *This source has been modified. Image 6. Consum Logistics. Reproduced from <http://bit.ly/1cowc6O&gt;. [Accessed: 06/05/2016]. Image 7. Abstract of the Mercadona business model divided into Human Ressources, Processes, Customers and Finance . Reproduced from <http://bit.ly/1pFdxfd&gt;. [Accessed: 06/05/2016]. Image 8. Mercadona Logistis distribution. Reproduced from <http://bit.ly/1UrhY7m&gt;. [Accessed: 06/05/2016]. Image 9. Retailing’s Vicious and Virtuous Cycles. Reproduced from <http://bit.ly/1D3kBDU&gt;. [Accessed: 06/05/2016]. Big companies are big for some reason. Today I want to speak about Coca Cola a big company with 500 brands and more than 3,500 products. The company, as can be seen in the figure, has approximately 24 million locations with more than 900 bottling plants. 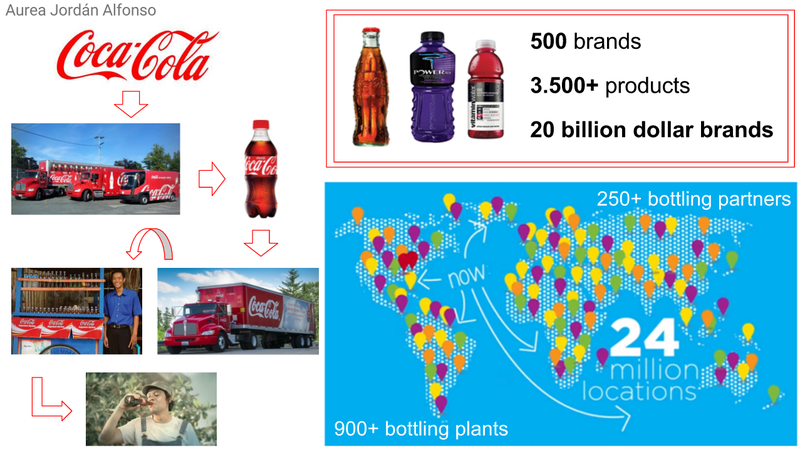 So, how can Coca Cola manage the product and information flows? First of all, Coca Cola company prepares concentrates, syrups and beverage bases. It is also the responsible for consumer brand marketing initiatives. Then, these products are sold to bottling operations. Finally, the bottling partners of Coca Cola manufacture, package, merchandise and distribute the final product to the customers and vending partners, who then sell the branded beverages to consumers. As can be deduced from the information above, the bottling partners of Coca Cola are one of the most important part of the chain. They work closely with restaurants, movie theaters, convenience stores, among many others and then these customers sell the product to the final consumer at a rate of more than 1.9 billion servings a day. Figure 1. Coca Cola logistics. Source: Own elaboration. Another interesting point which make Coca Cola a successful company is the marketing. Coca Cola needs to transmit the power of a Coca Cola so it makes announcements to achieve this. Typically, it creates advertisements that try to reach people showing situations of everyday life. Coca Cola creates different ads depending on the country and the target segment. According with all this information, two of the most important points of the company are the logistics which facilitates the management of the product flow and permits the availability of the products at the final store, and the marketing which transmits the information to the consumer. Actually, Startups are at their peak. This new meaning of entrepreneur company with fast growth is revolutionizing the business. In Spain, we can find Startupexplore which is the biggest community of startups and investors. In addition, if we focus in Valencia, the department of Employment and Entrepreneurship of the City Council tries to promote the entrepreneurship through their initiative Valencia Emprende. Otherwise, the intention of this post is based on discover some logistic startups and analyze them. The word Startup involves those companies of new creation that are in the first stage of operation. They present a huge possibility of growth and profitability. The fast growth is due they usually need lower funding, in comparison with other kind of businesses, for its implementation. This funding can be obtained from investors who, in return, demand for a percentage of the company. In addition, innovation through creative business idea is a key aspect which is commonly related with their success. Basically the main goal of them is to become a company but it requires having a good business plan and executing it correctly. Despite startups are becoming very popular specially in the technological field, they show reluctant to logistics being this a difficult ground of entry. Next, a list of some logistic startups is provided, therefore you’ll be able, by clicking on them, of seeing more information.logistic startups. Table 1. List of logistic startups. To go deeper in one example, I would like to write about Shipwire, one of the previous platforms in the list. This startup allows the user to carry out and satisfy any logistic demand such as shipping, warehousing or processing. They count with some warehouses around the world in strategic places where they can store your product. Therefore, they are able to provide fast and flexible shipping. In addition, they try for you to optimize all the process with the aim of guarantee the best price. Moreover, the user is able to customize its delivery by adding labels and personalizing inserts such as announcements or stickers, among other things. To sum up, startups present a great future and are a good way of innovate and provide a new focus to logistics, making easy the communication and transport of products. PALLETS CAGE: HOW A LITTLE IMPROVEMENT CAN HELP TO SAVE MONEY TO THE COMPANIES? In my current post I am going to talk about the “pallets cage”. The pallet cage is an improvement that was introduced to trucks. It was created for optimize the return of the pallets after doing a delivery. As is possible to see in the previous image the pallet cage is located in the middle of backside part of the truck. The improvement is nothing but add a cage for help with the pallets or additionals wheels. The cage was designed to solve a problem that happen with the return trip in the distribution sector. The problem with the return trip was what to do with the pallets when the commodities is served to the customer. Because sometimes for the characteristics of the commodities the customer does not need to keep the pallets in his warehouse. When the customer or the commodities do not need the pallets for be stored, these are returned to the producer warehouse. And in that case the pallets spend place at the truck that can be used to take commodities from the delivery place. The pallets cage helps to the companies to optimize all the place of their trucks in order to transport the highest quantity of products in the trip of return. Thanks to that companies have the possibility of organiza their routes for have all the time the trucks full-loads. With little improvements like that companies save money and achieve a logistic system more sustainable. How is warehouse of one big company? I am going to talk about the how big companies design his warehouses to be more efficiently, for that I investigated a lot of for one Company that is Porcelanosa. Porcelanosa makes building materials and decoration, kitchen, bathroom surfaces and new generation environmental and sustainability solutions, his revenues in the last year was more tan 800 million euros, today it has 4500 employees so it is consider a big Company. They have 5 logistics centers in Castellon that has 30.600 m2 to storage, capacity to 275.000 pallets and 15.000 boxes to move that use 43 stracker cranes with Easy WMS designed by Mecalux, aslo Mecalux designed the warehouse. If more easy undertand how they work if we can see that, for this reason I prefer add a video which is a tour for one logistic center.